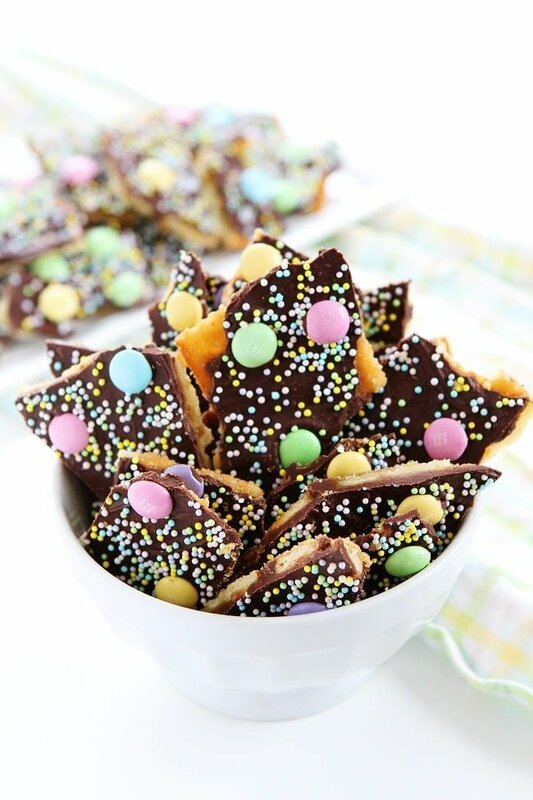 Saltine Cracker Toffee-everyone goes crazy for this simple, sweet and salty cracker toffee! It is a fun treat for Easter or any holiday! I LOVE Easter candy. I think it is my favorite candy of the year. I try to resist buying any until a few weeks before the holiday, but it is so hard to resist. I love all of the pretty pastel colors. I love buying Easter candy for Easter baskets, egg hunts, and eating buy the handful. I also love making special treats with Easter candy. 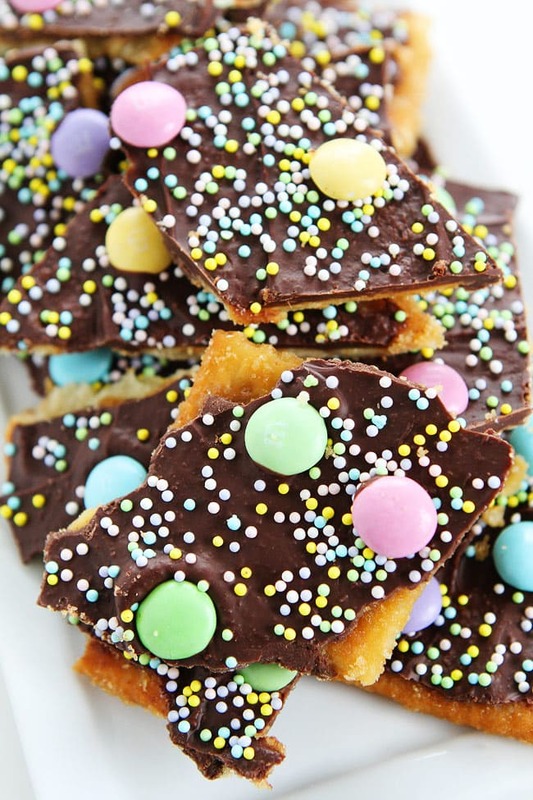 One of my favorites, Easter Saltine Cracker Toffee. This is the easiest toffee recipe and the BEST! Trust me! I love this toffee for so many reasons. 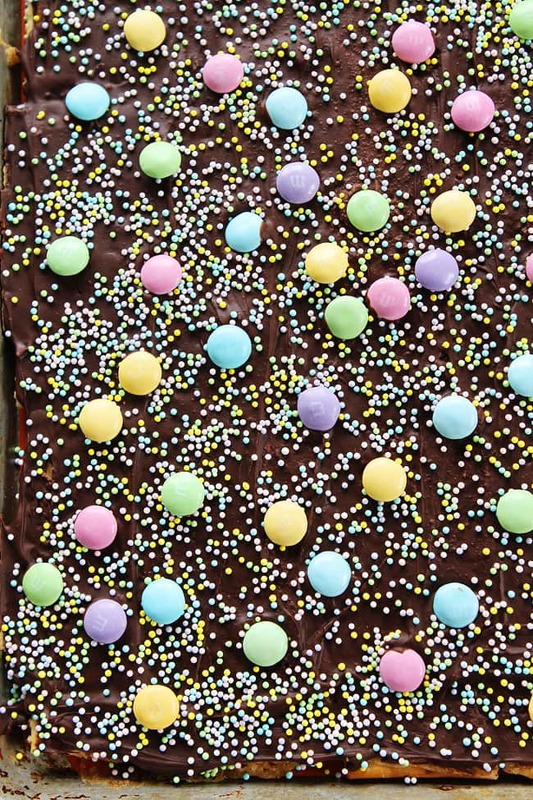 It is super simple, you only need five ingredients…well, six if you count the sprinkles and I really think you should use sprinkles because they make the toffee fun and springy! Anyways, this toffee is SO easy. It comes out perfect every time and you don’t even need a candy thermometer. You really can’t mess it up! You might think the saltine crackers sound odd as a toffee base, but trust me on this one. The sweet and salty combo is incredible! 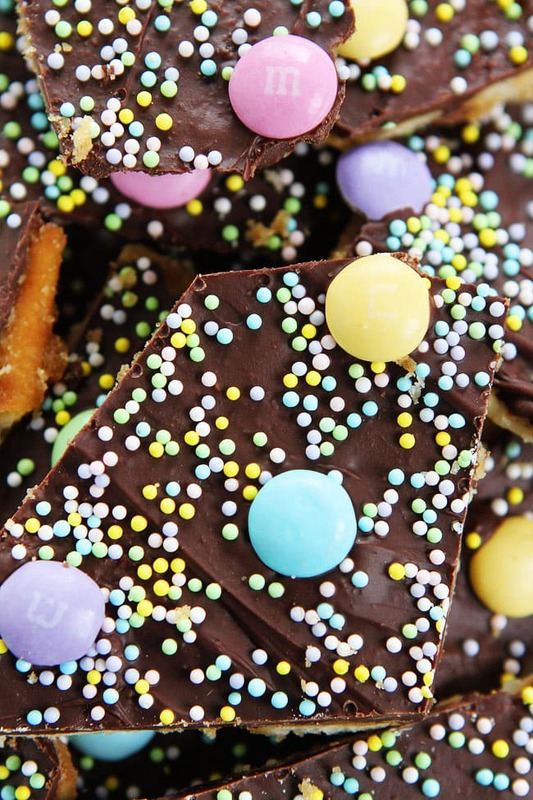 The toffee is crunchy, buttery, sweet, salty, and topped with a layer of chocolate. Mmmmmm! We love making this toffee for holidays because it is easy and everyone loves it. 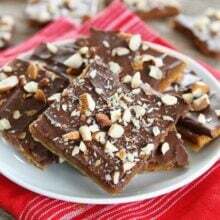 I usually make a batch of my Easy Graham Cracker Toffee and a batch of this Saltine toffee. Both are winners and never last long because this toffee is ADDICTING! Some call it crack and I know why because I can never resist. 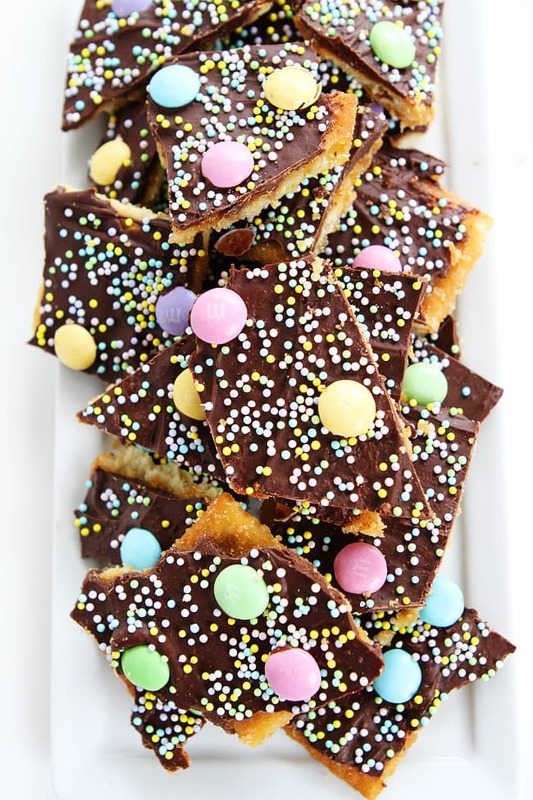 I added Easter candy and pastel sprinkles to make the toffee extra pretty for Easter. You can use nuts if you wish…I just wanted the toffee to be festive! You can mix the colors up for any holiday! 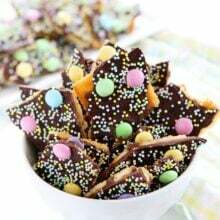 I also like to make this saltine cracker toffee for Christmas with red and green. It makes a great gift for neighbors and friends. I also love this toffee because it can be made in advance. It will keep in the fridge for a few weeks and in the freezer for a few months. My toffee is already done and now I don’t have to stress on Easter. The saltine toffee is ready for the bunny! 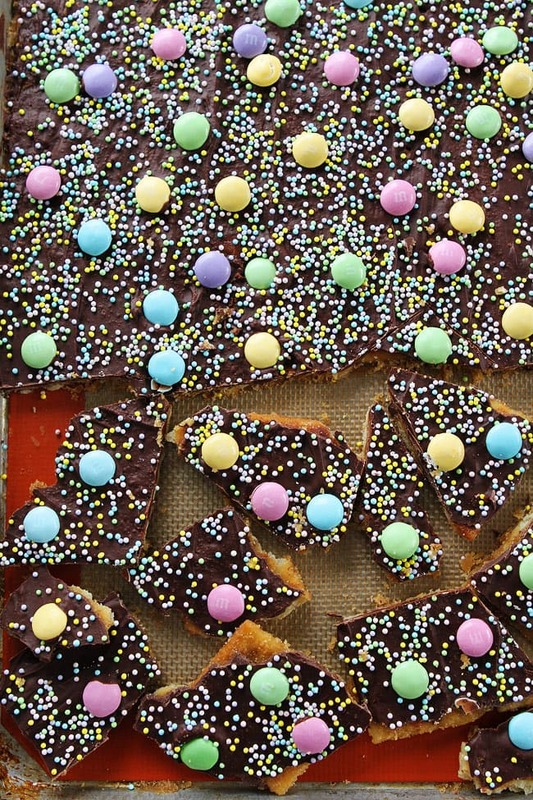 Everyone LOVES this simple, sweet and salty cracker toffee! It is a fun treat for Easter or any holiday! Preheat oven to 350 degrees F. Line a large baking sheet with a Silpat baking mat, parchment paper, or aluminum foil. If you are using aluminum foil, spray lightly with nonstick cooking spray. Place saltine crackers in a single layer, touching, on the large baking sheet. Set aside. In a medium saucepan, melt butter and brown sugar together over medium-high heat. Bring butter and brown sugar mixture to a boil. Boil for 3-4 minutes, stirring constantly. Pour mixture evenly over saltine crackers. Bake for 8 minutes or until topping is bubbling. Remove the pan from the oven and immediately sprinkle chocolate chips evenly over the top of the crackers. Let the chocolate chips sit for 2 minutes so they have a chance to melt. Spread melted chocolate with a knife or rubber spatula. Sprinkle with candy and sprinkles, if using. Let the toffee sit for about 2 hours or until the chocolate hardens. You can refrigerate the toffee for an hour, or freeze for 30 minutes. When chocolate is set up, break the toffee into pieces and serve! 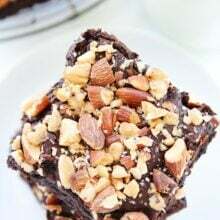 Note-You can top the toffee with chopped pecans or almonds. You can also mix up the candy and sprinkle colors for any holiday. The toffee will keep up to 2 weeks in an airtight container in the fridge or in the freezer for up to 2 months. Ahh look at the pastel colors on the chocolate!! I love love it!! So fun! A great dessert to add to any Easter basket! What a perfect treat for Easter! I grew up eating a toffee just like this that my Nana always made. This brings back so many happy memories! Toffee has always been a favorite in my house and this version is so fun! Have fun in Waco this weekend, Maria! This looks really yummy! Have a great time at The Magnolia Home B&B – sounds like a fun time will be had. I specially enjoy chocolate! When i buy or choose foods which contain chocolate. Thanks your post! It looks very nice! I think it is also delicious as its appearance. hey girl This looks so yummy! And I am so jealous that you are going to Waco! I just love Chip and Joanna! Us ladies at church have talked about going down there to their new store! Ya’ll have a lot of fun! Just made this toffee & it’s great! Hope you have a great time in TX. Just want to say thank you! Needed a quick recipe to please this weekend and this went down so well 🙂 and it was so easy! I might make them again even if it isn’t Easter, love the salty/sweet combo! 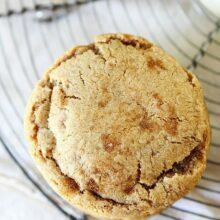 This can also be made with matzo instead of saltines for a delicious dessert that is kosher for Passover! Hi – what is the size of the pan that you used? Thanks! A large baking sheet, I think mine is 13×18. Amazing!!! Very easy and really delicious. The sweet and salty combo is a winner. Highly recommend.